In the “new golden age of television,” the most ambitious, scripted prestige fare is endlessly dissected while the rest of the broad television universe is ignored. In We’ll Watch Anything, The A.V. Club challenges the boundaries of television criticism by valiantly consuming anything on the dial. In this installment, Netflix’s live-action Richie Rich series. The pitch: Remember Richie Rich? He’s back! No, not in pog form, but in the form of an equally outdated medium: the multi-camera sitcom. Netflix is far and away the leading streaming platform in terms of original programming, but between the success of Transparent and the Woody Allen coup, Amazon Prime is breathing down Netflix’s neck. Kids’ programming is a battlefield in which neither service has established dominance, though Amazon Prime has aggressively developed live-action kids’ series as part of its democratic pilot season. Not to be outdone, Netflix premiered 10 episodes of its revamped Richie Rich in February, then supplemented that with a second 11-episode season a mere three months later. The series is the most high-profile live-action take on the Harvey Comics character since the 1994 Macaulay Culkin movie tanked at the box office. Could it be worth watching? Sure, if only based on the involvement of Head Of The Class star turned producer-director Brian Robbins, who has a strong sensibility for tween-skewing television. He co-created Nickelodeon’s All That, the junior sketch comedy series that set Kenan Thompson on the path to “What Up With That?” Robbins also co-founded AwesomenessTV, the kid-focused DreamWorks Television arm through which Richie Rich is produced, and his imprimatur carries weight in the world of children’s television. What’s not to love? Let’s just say that if Richie Rich was a publicly traded stock, the trailer would have sent its value plummeting. 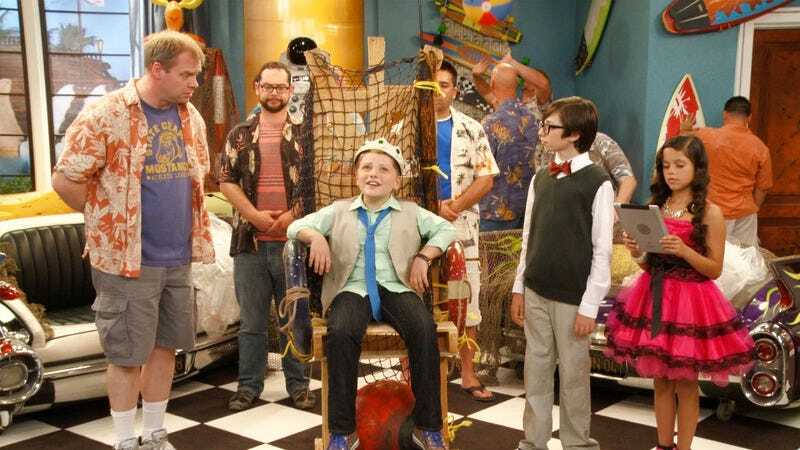 Despite young Richie’s opulent lifestyle, the show doesn’t look particularly luxe. Granted, it’s a scripted show for kids, not an actual episode of MTV’s Teen Cribs, but a few upper-crust establishing shots can’t make up for the chintzy production value. The action is generally limited to three small rooms within Richie’s Queen Of Versailles-style maxi-mansion, and even the laugh track sounds tinny. Perhaps the producers didn’t want the outdated laughter to be too obtrusive, but it sounds like the show was filmed in a studio with tissue-thin walls as Everybody Loves Raymond was filming a reunion special next door. Plus, a couple of the characters are pretty ill-advised, but more on that in a bit. How was it? Honestly? Not that bad. Richie Rich isn’t a great show by any stretch of the imagination, and it can be downright offensive at times, but it’s a solid enough execution of its premise and it measures up adequately against its genre peers. Rich was developed by Robbins and Jeff Hodsden, who along with his writing partner, Tim Pollock, penned nearly two-thirds of the show’s 21 episodes to date. Hodsden and Pollock are no strangers to the tween sitcom. They’ve written for The Disney Channel’s The Suite Life Of Zack And Cody, its shipbound spin-off, The Suite Life On Deck, and A.N.T. Farm, and they bring the same comedic sensibility to Rich, which would be a perfect fit for Disney’s line-up had Netflix not snapped it up. That said, the show is such a drastic reimagining of the source material that it’s unlikely to win over Richie Rich purists, assuming such people exist. In the comics and the Hanna-Barbera cartoon from the ’80s, Richie is a trust-fund baby, a passive entity whose insane wealth was foisted onto him by his father, titan of industry Richard Rich Sr. Being the world’s richest kid leaves Richie socially hamstrung and unable to relate to his peers, but he has a heart of gold and relishes in putting his family’s fortune to use helping the needy. In this version, Richie (Jake Brennan) made his own fortune, thank you very much, though he did so in such a ridiculously contrived manner, it only works as wish fulfillment for junior one-percent wannabes. As Richie explains in the opening credit sequence, he managed to synthesize a new fuel source using all the vegetables he didn’t want to eat, yada yada yada, he’s a trillionaire now. Yes, he combined readily available vegetables and somehow wound up with a plant-based fuel instead of a nutrient-rich green drink. And yes, that’s trillion with a T, which would make Richie not only the world’s richest kid, but its richest person. No wonder the title isn’t stylized, as it often is, with cent symbols replacing the Cs in Richie’s name. Between the 13-figure valuation and its origin story, Rich is neither concerned with cents nor sense. By putting Richie in control of his enormous wealth, Robbins and Hodsden have turned the source material on its gilded ear. This Richie isn’t hurting for friendship. He has a pair of BFFs who act as mutual foils: Murray (Joshua Carlon), Richie’s penny-pinching money manager, and Darcy (Jenna Ortega), a spunky spendthrift who delights in burning through Richie’s cash. Cadbury, the Rich family’s distinguished butler, is nowhere to be found, but there is room for Richie’s robot maid, Irona (Brooke Wexler), who is so advanced she’s indistinguishable from a real live pin-up girl. (“I got the supermodel model,” Richie says.) Richie’s father Cliff (Kiff VandenHuevel) is no master of the universe, though he’s such a profoundly delayed manchild he probably still owns He-Man action figures. Richie also has an overachieving big sister, Harper (Lauren Taylor), who treats Richie with the non-specific contempt older siblings have for younger ones despite the glamorous life he affords her. For anyone wondering where Richie’s mother is, I’m still wondering myself. In the six episodes I watched, she’s never mentioned. Rich’s makeover of the source material is dramatic enough that it would have certainly triggered an internet backlash and cries of “You’ve ruined my childhood!” were the character more popular. The fact that there was no such outcry speaks to how poorly the once-cherished character has fared in his old age. The comic debuted in 1953, back when the country was in the midst of a post-war economic rally and Richie Rich embodied a capitalist fantasy that made him the perfect superhero during a time of widespread prosperity and unfettered optimism. We look at wealth differently now—the cultural idea of the “poor little rich boy” is long dead—and the only thing to comfort us is the notion that maybe having lots of money is more trouble than it’s worth. To that end, the new Richie is beset by the challenges most common to the nouveau riche. He’s a kid with so much freedom he has to set his own boundaries, and he has trouble managing his relationships, the dynamics of which have naturally changed following his veggie-fuel windfall. Richie’s biggest flaw is his tendency to overpromise or overdo. Either he’s struggling to parcel out his time—the one resource with inflexible limitations—or he’s coming up with some hilariously out-of-touch solution for a common problem. For any kid who’s ever wondered how they’d approach a book report differently with a practically infinite budget, Richie Rich has some ideas. Rich also has some creepy and troubling character dynamics. Irona alone would be an embarrassment of riches were one mining for kids-show awkwardness. The Irona of yore was one of few reliable companions for the socially isolated Richie, and though she was a robot maid with human facial features and softer curves than Rosie from The Jetsons, she looked more robot than human. Next-gen Irona is all woman and smoking hot, which is why Richie picked this model, and so goes Rich traipsing into the fraught pubescent territory that snares many tween sitcoms. New Richie, who is about 12 or 13, is a few years older than the original character, who was still young enough to view girls as nothing more than the number-one cause of cootie outbreaks. He’s at the age when boys first start obsessing about girls, so while Irona was historically Richie’s platonic companion, she’s now tacitly a masturbatory aid. Richie doesn’t actually hit on Irona, but in “Fir$t Love,” the first season finale, he woos Urona, an age-appropriate hot robot sent to replace Irona, who has been sent out for repairs. It’s up to Murray and Darcy to save Richie from Urona’s humanoid claws after they discover her “cheating” on Richie by making out with a vacuum cleaner. (I suppose now is an appropriate time to mention the domestic robots have sexual needs and are attracted to literally any other electrical device.) If the producers were hoping to recreate the general ickiness of ’80s curiosity Small Wonder, they should pat themselves on the back for making Irona such a well-oiled ick machine. Then there’s Murray, by far the most shocking aspect of a show by which I did not expect to be shocked. If there’s been a more egregious recent example of the miserly, milquetoast Jew stereotype, I haven’t seen it. The name Murray evokes a nagging, cartoonish Jewish accountant, which is exactly who the character is. The screenshot below sums up Murray’s tone and characterization pretty effectively, especially since it was taken as Murray was saying the line “I don’t make mistakes when it comes to money.” That’s from “More Or Le$$,” a season-one episode in which Murray is terrified that Darcy is spending Richie’s money too fast, as if no one explained to him that Richie’s holdings surpass the GDP of Poland and Austria combined. The stereotyping gets worse in “Plu$ One,” when Richie invites Murray to a black-tie function and Murray spends the whole evening squirreling away free food to take home with him. Apparently it’s up to the kids watching to figure out the peril of stereotypes themselves. Aside from those elements, watching Richie Rich reminded me of an experience I had years ago during a road trip with an ex-girlfriend. She flipped the television to an episode of That’s So Raven, which I’d never seen at the time and wasn’t excited about sampling. She’d started watching it with her niece and was surprised to find herself enjoying it enough to watch on her own, and to my shock, I found it surprisingly funny. Rich is not to the level of the underrated Raven, but it did make me laugh intermittently. Many of the jokes are delightfully absurd, like a recurring Eurodance DJ character, a Swedish house sensation named Swedish House Sensation. But most of the praise belongs to the cast. Tween sitcoms generally don’t read funny on paper since most of the jokes are goofy puns that only land if the delivery is on point. The actors manage to sell the lines more often than I anticipated, especially Ortega, whose Darcy is Rich’s secret weapon. Ortega, who also plays the child version of Jane The Virgin, has naturally sharp timing and an energy reminiscent of Jodie Sweetin at the height of Full House. When I did laugh, it was most often at one of Darcy’s line readings. Would you watch it again? If I had a niece or nephew in the target audience, I could be cajoled into watching it with them. It would make for a teachable moment about stereotypes, plus it’s the sort of thing that might make a kid remember me fondly should they become a trillionaire.